I knew there would be some pictures and here they are. Now I know Kristie has sent these pictures to most of us in our family and about 5 million of their friends and family, but I still wanted to show them again to everyone else who might not have seen them. 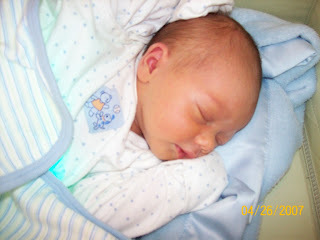 I also got an email from our cousins John and Cindy Phillips with a couple of pictures of their new grandson. How cool is that? Well, here they are. Little baby girl Noelle Kristine Smith was born on April 20th – a birth date that she will get to share with her 1-yr-old cousin Vivian in Canada. What are the odds of that? Check this out. We have been blessed with the news of another baby born to Luke and Darci Barret. The proud grandparents are cousins John and Cindy Phillips. This is so cool. This is our new little boy Jake and his sister Riley (2 years). 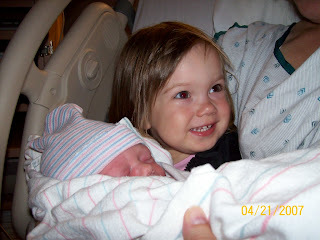 Jake was born on his sister's birhtday the same time even. April 21 he was 7 lbs not as big as Noelle (poor mommy). The parents are Luke and Darci Barrett. (our daughter) Thanks for keeping us up to date on all your family. One day after Noelle was born. Our family is truly blessed. They share the same birth day also. What are the odds of that? By the way, both of those kids are so cute they have to take after their Grandmother. Check it out for yourself. Here is a picture of cousin John when he was a kid. Yep, Riley and Jake for sure take after Cindy's side of the family. Keep the pictures coming. This is pretty fun.